New lines like the Eglinton Crosstown will be worth some inconveniences, but Metrolinx appears to be battling City Council for the title of most dysfunctional transit builder. Will the Eglinton Crosstown construction bring us to a brighter future? Photo by M Falkner in the Torontoist Flickr Pool. Metrolinx, mon cher ami, we have to talk. Or, more importantly, you do. Let me say a few things first, to explain the problem I’m having with your communication in this relationship. Like several thousand other Torontonians, I live in the midst of the Crosstown construction project. For several years, the road I live on has been closed at the intersection with Eglinton. Street lanes and sidewalks are rerouted or closed all over the place. There has been constant noise, constant rumbling, constant dust—not to mention a small building collapse. Un beau gâchis, as you can well imagine. But these are mostly necessary inconveniences, I know, to build what will be a wonderful transit line. For you, mon ami, I will endure all of this and smile. Because this east-west line, cutting through busy midtown centres along the central stretch of a major boulevard that itself extends from Scarborough all the way to the airport (hint, hint), is going to open up many opportunities for mobility in the city. Faster travel. New development and density along the line. Better access to jobs, education and recreation (the Science Centre!). Connecting across Yonge St. without transfer. Fewer cars on the road. 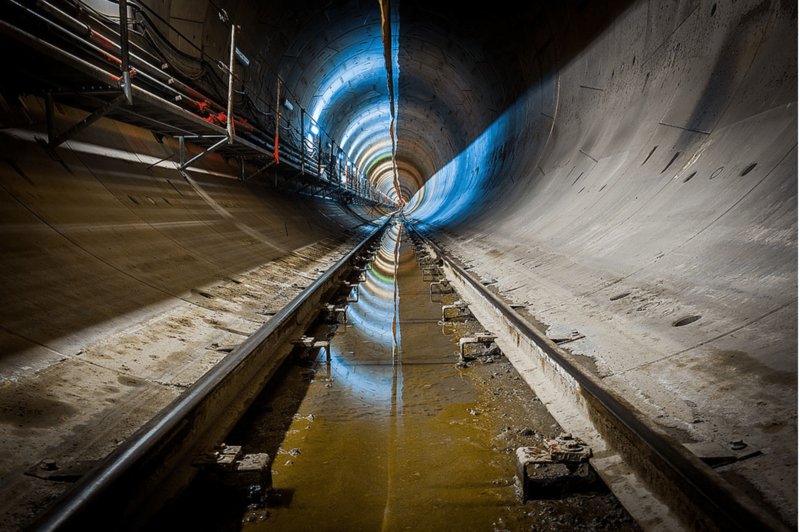 Even though a huge chunk of it is unnecessarily underground, the Crosstown is still a great transit line that is going to bring good things to the city. I am excited about this project. Sometimes I get so happy about it, I forget all about the huitième cercle de l’Enfer that is Presto. The Crosstown is that good. But you must let me know what is going on with this project, Metrolinx. Much as I would like to, I cannot read your mind. So it was a shock when a couple weeks ago, I woke to find you had closed yet another road, the one everyone uses to get in and out of the neighbourhood. There were no signs by the newly fenced-off asphalt, no flyers to the residents. Je me suis prise un râteau. It was like coming home to empty rooms, but no note. I stayed up all night wondering, what did I miss? Did you try to tell me, but I just wasn’t listening? No, I realized it was more of the same communication style you have had all along. When my road was closed for good several years ago, there was no notice of that either. And I have no idea how long it will be closed. We are all quite used to the cul-de-sac now; what will happen when traffic is allowed to return? The communication failure continued on Twitter, when in reply to my complaint about this newly closed road, you advised I could call you with my questions. Oh, you are too drôle, reversing the obligation to communicate like that. Pretending it isn’t your responsibility to provide these details before anyone asks. It went downhill from there. Our ward’s councilor, Joe Mihevc (who clearly also had not been advised), followed up with you to get some information about the length of the closure, and reported back that it would be two-to-three years. But the information you eventually provided on Twitter, via a link to a newsletter that randomly grouped a list of updates big and small, indicated six-to-eight months. Quoi croire? Those are very different timelines, and this is poor communication all round. A week later, I was greeted at the subway exit by a friendly Metrolinx person, who gave me a card with the new changes for pedestrians. It is a beautiful card. It has a map. It still does not indicate how long these road and sidewalk closures will last. I know you pay very little attention to what I do – you are busy with your important project – so I feel the need to explain that it isn’t just about those of us who live here. Sometimes people visit me. No, really. Friends and family, people I employ to repair my house, taxis to take me to airport. All kinds of people. And they are unfamiliar with the area and its constant reconfigurations, and become quite frustrated when they cannot figure out how to get to my place. I cannot spare them this frustration if you will not tell me what the plan is. Their frustration quickly becomes my own. Ça me prend la tête, tu comprends? Yes, Crosstown, you have held public information meetings in my area – thank you for that. I think they occur about once a year? Unfortunately, I have not been available to attend, though I read what is posted on the website and send emails with my questions. The last time I wrote, it only took 12 days before someone replied. (I note that the email address, [email protected], is the same for every contact person – efficient and impersonal!). The time before that, it took quite a while before I could get action on the mess the workers had made of my street, by flooding it in winter and then leaving a river of ice several feet wide and several inches deep. What fun we all had trying to cross the road with such treacherous conditions! As I recall, I had to go through a friend of a friend who knew someone who worked on another part of the project who knew who to call. Un véritable dédale. Why, it was even more byzantine than the instructions for how to transfer to a non-Presto bus with a Presto card. I confess I did ask myself why it was even necessary to make such a request. My neighbours and I do want to be supportive partners in this great thing you are doing, but we do still have to live here while you do it. And it really is not okay for you to act like we are not here, for your workers to treat our neighbourhood as a gutter. Nor is it okay to act like you do not have to speak to us regularly, to give us advance notice with clear information about the next great obstacle you are going to throw our way. I am not asking you to stop the project, nor to work fewer hours on it so I can get more sleep. I am only asking you to clean up after yourselves and, especially, to communicate. There is a lot of research and examples of successful practices about how strong communication with the public about change or disruption can reduce complaints, prevent conflict, maintain and even build community relations, and reduce congestion and collisions–and thus save money, time and construction delays. You and I both want people to ride this train. Its brand should be positive, progressive, part of the community. It is amazing how a negative perception can stick, even when it’s largely unjustified – remember the “St. Clair Disaster”? Let’s not go there again. Mon cher Metrolinx, you appear to be battling it out with City Council to see which group is the bigger foire d’empoigne when it comes to transit. Who can be the most dysfunctional? Who can be the least accountable? Who can waste the most money? City Council is not a good mentor here. Aim higher. You have noticed I am practicing my French, n’est-ce pas? It is the language of diplomacy, of perfect communication. But also, if you and the rest of this city continue to be this incompetent when it comes to just about every aspect of transit building, I just might pack up and return to my birthplace of Montréal. You won’t notice at first. You think you don’t need relationships with people like me to build your projects. But you do. You will miss me, eventually. Bien. Maintenant c’est à ton tour. Alors, parle-moi. Tell me everything.